There’s a beautiful set of New Escapologist badges available from our Glaswegian friends at Big Wow Badges. They come individually at a cost of 60p or as a glorious set of four. 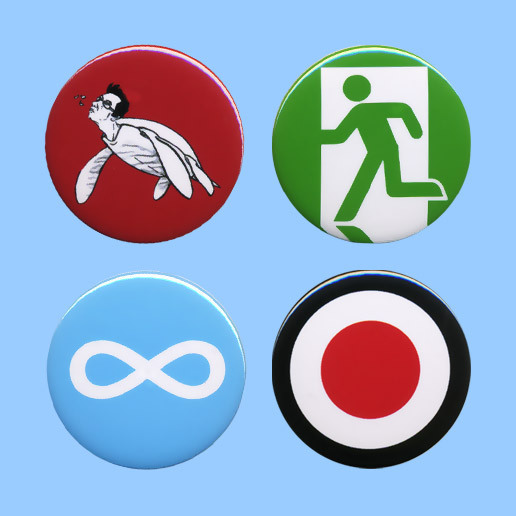 Available are the the definitive ‘escaping man’ symbol; the Fluchtverdächtiger (escape suspect) badge from the Nazi concentration camps; the cool blue symbol of infinity or Absurdity; and Samara Leibner’s handsome turtle illustration.